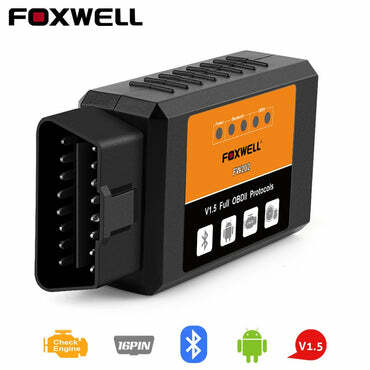 With FOXWELL NT301, you can scan the engine system via ecu obd2 port, read and clear the engine error codes , find out the exactly problem, repair it , and turn off the MIL engine light. Include: read codes, erase codes, I/M readiness, live data, unit of measure, on-board monitor test, component test, vehicle information, modules present, view freeze frame. Quick state emissions readiness check and drive cycle verification. they can also help catch intermittent problems or confirm repairs during a drive cycle. NT301 has installed the code library, it is used to search for code definition, saves your time to search online. and allows you to focus on any suspicious or symptom-specific data parameters. 2. It reads freeze data, which shows engine conditions such as fuel trim, engine coolant temp, etc., at the time the malfunction indicator lamp (MIL) was set. 3. Automatic VIN acquisition and decoding makes it much easier to read manufacturer specific codes and enhanced mode 6 data. 4. Clearly arranged keypad, menu-driven navigation, hotkeys and 2.8" TFT color screen together make it extremely easy to use. Does not support Renault / Dacia Logan , Clio. Ssangyong cars need after 2015 years. ​​Does not support Lada , UAZ , VAZ . 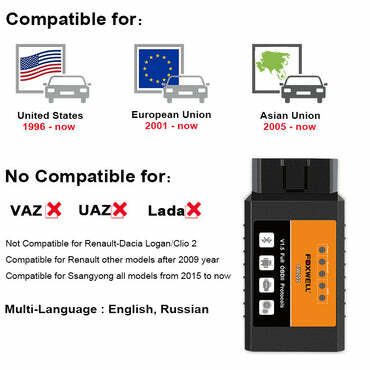 Notice : No Car OBD2 Scanner can work for all cars, If the device does not fit for your car, please try to test on another newly car. Stpe1: Download the update tool from foxwell official website, connect the NT301 to PC and login in the foxwell program , the device will be automatcially detected. Stpe2: You can go to setting , select the language of your software package. Step3: Click online update, it will download the software, then click on Offline update, you may install the patch. But we have French ,Spanish ,German language user manual on the foxwell office website, (foxwelltech.com).